We are delighted to announce our partnership with Asian Trails to provide a post-Forum cultural journey and adventure in Vietnam, with an extension to Cambodia for those who wish to visit Siem Reap. 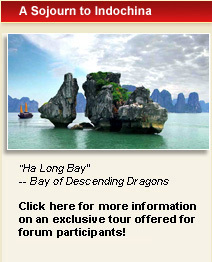 This is an exclusive tour for Forum participants only. Because space is limited, reservations will be taken on a “first-come, first-served” basis. Book now to assure you do not miss this extraordinary opportunity!